Cycling offers significant health benefits from the increased aerobic fitness. Given the rise in health problems associated with physical inactivity and obesity, cycling could play a major role in improving the nations health. 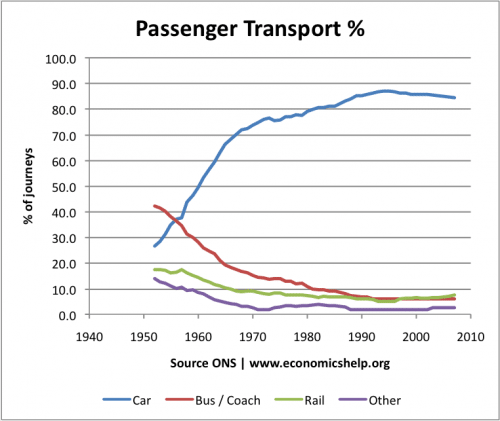 However in cost-benefit analysis of transport, health issues are often ignored. Unfortunately, concerns over the safety of cycling deter many from one of the most accessible forms of exercise. The tragedy is that as people lead increasingly stationary lives this causes hidden problems such as rising levels of diabetes and heart disease. The post war period saw a sustained fall in pedestrian and cycle transport. In the post war period, transport policy was driven by the attempt to accommodate the growth of motor transport. However, combined with a decline in manual labour, this era saw a sharp fall in physical exercise and a resultant increase in health problems. Rather belatedly, transport policy has begun to acknowledge wider issues such as health, quality of life in determining transport policy. Despite cycling often being perceived as a ‘dangerous’ exercise. Society is arguably ignoring the hidden dangers of sedentary lifestyles. There have been various studies which show the net health benefits of cycling. One of the largest was the Copenhagen Center for Prospective Population Studies It involved 13,375 women and 17,265 men aged 20-93 from a population of 90,000 living in central Copenhagen. Of this group 14,976 cycled regularly. Copenhagen has a low accident rate helped by good cycling infrastructure. But, the size of the study shows the great potential for health gains from a city which encourages cycling. 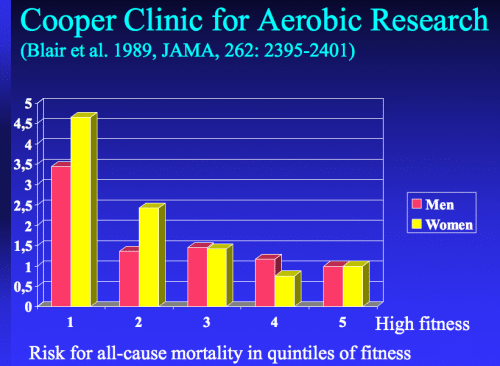 Another study suggesting an inverse relationship between mortality rates and levels of fitness. When studying the health benefits of cycling, it is usual to focus on the health benefits of those who cycle. But cycling has also benefits to non-cyclists. Lower accident risk. Cyclists are rarely involved in serious accidents. On average, there is annually one or two deaths caused by cyclists compared to a national death toll of 2,000 from road traffic accidents. Encouraging lower speed and more pedestrians to use local roads. Roads which are dominated by motor cars discourage pedestrians and cyclists. 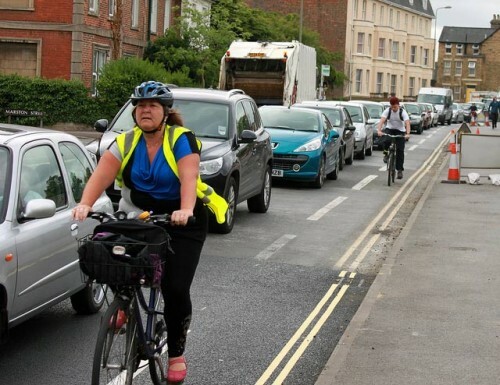 The presence of cyclists on roads, may encourage lower speed and others to follow suit. In the past 30 years, levels of obesity have sharply increased. The proportion of men who are obese (BMI over 30) increased from 13.2% in 1993 to 23.6% in 2004. 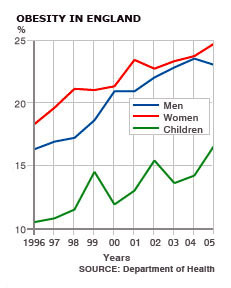 For women, obesity levels increased from 16.4% in 1993 to 23 .8% in 2004. Up to 66% of men and 75% of women report low activity levels which substantially increase their risk of contracting up to twenty chronic diseases or conditions. Young people also have low activity levels. They are less likely to walk or cycle to school and computer games have often replaced outdoor exercise. Increased portion sizes (e.g. McDonalds super size me) See: The Men who made us fat – BBC documentary blaming portion sizes and marketing by fast food chains. Cultural change, such as, increased prevalence of takeaways and unhealthy eating. Lack of Exercise. In 2004, only 34% of men and 23% of women take part in more than half an hour of exercise daily. It is estimated obesity accounted for 18 million days of sick leave and 30,000 premature deaths in 1998. In 2000 Chronic Heart disease (CHD) was costing the UK economy about £10 billion per annum in days lost due to death, illness and informal care for people with the disease. Cycling is a good exercise for those who are overweight. Cycling occurs at around 60% of VO2 Max, and so doesn’t place undue strain on Cardiovascular system. It is an ideal target for basic aerobic fitness which helps burn calories. Cycling is also low impact on joints. Running places 200-300% more stress on knees and hip joints. Therefore, cycling is less prone to cause this kind of injury. Promoting cycling and walking would help contribute to improved physical fitness and better health. 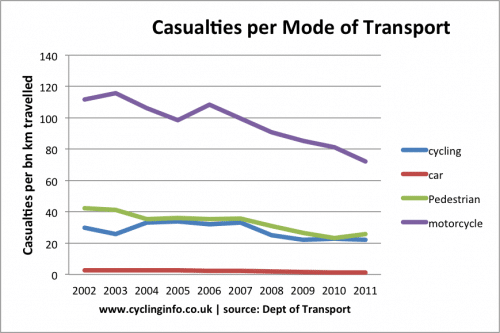 Fears over safety is a big discouragement for people to take up cycling. Cycling is perceived as dangerous and harmful to health. A cycle accident is often front page news, but this distorts the wide picture that cycle accidents are very limited compared to deaths from chronic heart disease and obesity related illness. 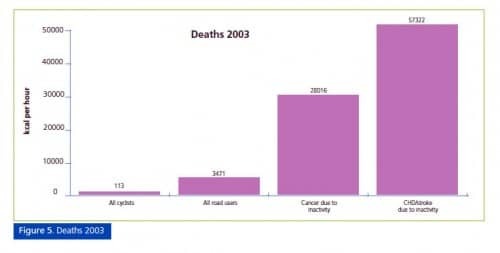 The above graph showing relative deaths from cycling v disease due to inactivity may surprise many. When formulating policy, it is important to stress overall health benefits outweigh risk from other factors. Governments often set transport policy according to limited budgets and short-term priorities. Many of the health benefits of cycling are not immediately visible. However, in the long-term, there are clear economic and social benefits from encouraging transport which promotes health as a side effect. Encouraging cycling is increasingly important since society is becoming more inactive and prone to obesity. Encouraging cycling and better health could provide a strong economic and social return on the investment. When formulating policy on transport, it is important to take wider health factors into consideration and not just cost and convenience. I’m 36 and I’ve had four lots of major back surgery relating to degenerative disc disease. I only started cycling actively last year and regularly this year. There have been times when I have not been able to walk because of back pain (at 15 I was in a wheelchair). I can honestly say that my back has never felt better than it does now and I really feel cycling has had a big part to play in that. I was initially concerned that the position needed for riding a road bike would increase my problems but I haven’t found that at all. It’s obviously important to have a strong core when you have a bad back and I’m sure cycling has really helped mine.